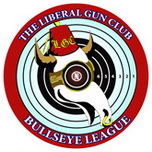 The place to find LGC Postal Matches, our own Bullseye Club, and ongoing conversations about marksmanship, practice, and safety. One of the first things y'all told me was to enjoy practicing with .22s, and do I ever!...Especially the Browning BuckMaster. How about a little .22LR range show-and-tell? Well, it's a rifle, not a pistol, but... Here's my bipod-mounted Winchester 52 having fun at 25 yards. No rests, just bipod-and-shoulder. "We have met the enemy and he is us." Pogo. Or, here's the CZ 455 Varmint (similarly bipod-and-shouldered) at 25 yards. Yes, that IS 5 shots there... I love that rifle. Sorry... This is not as tiny as the above, but is my Beretta 87 Cheetah (not Target) at 25 yards offhand. This little guy shoots FAR better than its 4" barrel would indicate. Plus, it's cute. I do love me some .22 as well. Just for clarity, none of those are really "typical" except the Winchester targets. Cherry-picked to the extreme. I blush, Sail. I do love rimfire. I wish I had some targets with my CZ 453 .17 HMR but I can’t find any in my piles. I pulled out some typical (I.e. really good) examples. All of these are rifles on bipods and a rear bag, shouldered. I don’t run the software that Sail does since I only have Apple products so they are measured with calipers. Here’s one from my Kidd rifle “Boyd”. The holes down the center are sizers. 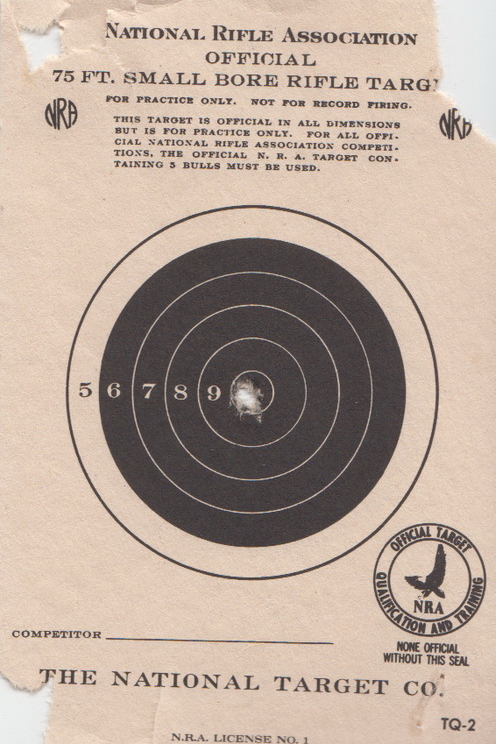 The holes on the targets are five-round groups. This one is from 25 yards. Average Center to center diameter for the four groups of five rounds is 0.094 inches. It’s a good shooter! Here’s one from the “Sleek Black Beauty” at 50yards. Ignore the sighters and sizers. Five round groups, average of three groups is 0.24 center to center. And one from my Frankenruger compact from 50 yards. I never expected it to shoot like this! Average of four groups is 0.34 in. I need to shoot some groups with my CZ 452. It may be better than any of these. Need some warm weather first! Last edited by Bucolic on Wed Feb 07, 2018 2:00 pm, edited 1 time in total. Thanks, Sail! Maybe we should set up a match for rimfire rifles. Something to think about. HotheadP, please note that for my targets, I am not concerned that they are not on the target center. All of these were deliberately aimed off center. I was shooting for consistency. Bucolic wrote: Thanks, Sail! Maybe we should set up a match for rimfire rifles. Something to think about. VERY nice idea... Keep it to 25 yards for the winter- I can open out to 50 in the summer. 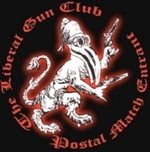 I have to share one more from an early postal match. This one is shot from fifteen yards, seated with the Sleek Black Beauty. Bucolic wrote: I have to share one more from an early postal match. This one is shot from fifteen yards, seated with the Sleek Black Beauty. Hey, what did those flies ever do to you? senorgrand wrote: I love that FrankenRuger! I am thinking about putting a kidd single stage trigger in it. The one that’s in it is fine but I do love me the kidd triggers. Had some 50 yard fun with my Marlin today. Sent it to 100 for a few. It was a bit windy. Pretty happy with these shots. Wasn’t that postal match seated, but with a sling for support at most, no bench? These were an attempt to test different brands in my Kidd 10/22 at 50 yards. I believe the orange dots are 2” and it was with sandbags front and rear. Last edited by leitmotiv on Tue Feb 13, 2018 12:29 am, edited 1 time in total. 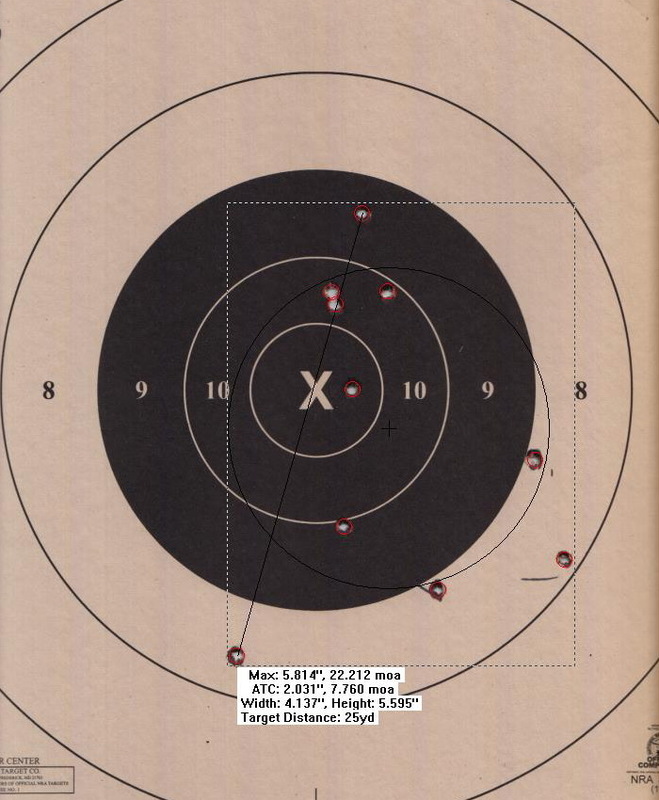 Great shooting and a great rifle. Except for the barrel, it’s nearly a twin to my Sleek Black Beauty. Down to the Sig Zee rings! Edit: Also, yours has the two-stage trigger and the cool flat trigger blade. Nice! What is the trigger pull weights? Also, was the mallet for the barrel installation? Bucolic wrote: Great shooting and a great rifle. Except for the barrel, it’s nearly a twin to my Sleek Black Beauty. Down to the Sig Zee rings! Thanks, I was noticing how similar they were. The Zees were for another rifle originally, but I upgraded it to a more beefy setup. These were perfect for this build. I’ll probably use another set for my next build (I have a silver Kidd receiver just waiting). 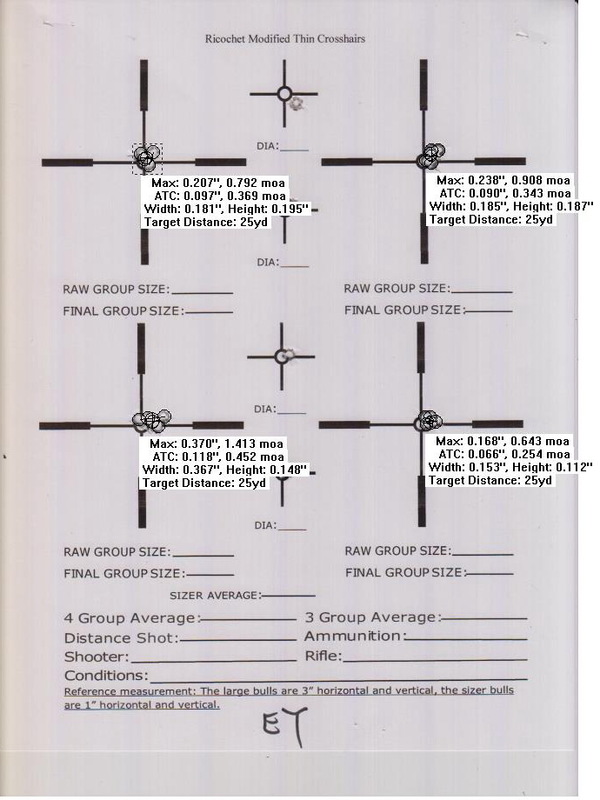 Bucolic wrote: What is the trigger pull weights? Its been a while (2014), but i believe it was set at 3+3, so 6 oz total. It’s almost light enough that if a feather brushed it the rifle would send its payload down range. Bucolic wrote: And, yes, the fly shoot was seated, no support other than a sling. Thats what I remember. That’s some nice shooting there for off hand, even at 15 yards. I’ll have to go look at my target, but I’m pretty sure I missed some of those suckers. Bucolic wrote: Also, was the mallet for the barrel installation? Yes, that sucker didn’t want to seat! 3 oz/3 oz is brave!! Mine is 8/8 and I only need to think about firing and it goes. Kidd has a bunch of new fluted barrels that are tempting and would look great on your silver receiver! It’s all about keeping the booger hook... never mind, Just keep the finger away from the trigger until you’re ready! And don’t let anyone breath near you. So far it’s been a pleasure to shoot. I’m thinking of getting a barrel blank for the next one and having it threaded to the receiver by Connecticut precision. Sort of the next step into insanity. Oh man, you got it bad! I like the plan! !